Itâ€™s a cold, crisp morning on the second day of our trek along the India-Nepal border. Wind slaps against the lodge where we slept the previous night, and icicles cling to the rocks outside. But the sun shines brightly, and the trail zigzags upward along a steep switchback course. In time, my body warms and I begin to sweat. When I reach the top of a tree-lined hill, I pause for a few moments in a soft spot of green leaves covered in tiny berries. Rhododendrons bloom all around me. Not much farther on sits a tea stop and rest area called Kaiyankata. The trail here is lined with fluttering flags, denoting the international border: the road is India, the tea shop Nepal. I stand precisely on the border line, jotting notes. I am everywhere and nowhere on that line. The air way up here is so blue, so clear; the breathing is clean and easy. Itâ€™s amazing how much air can exist in a place with so little of it. In addition to serving tea to trekkers, the villagers near Kaiyankata keep fields of green peas, and they make rock-hard cheese and butterâ€”commodities sold in Darjeeling, a dayâ€™s hike away. Occasionally on the trail, we pass villagers heading to the city with yaks and backs saddled with heavy goods. We sit in the sun, sipping sweet tea and admiring the silence for a while. Then, just as we prepare to hit the trail again, we watch an old man scurrying back and forth with greens in his hand. Our guide explains: a woman in a nearby house is afflicted by an unhealthy spirit, and the villagers have called for an exorcist to perform a ritual to make her well. Our guide consults with villagers and they welcome us warmly. We are led into a kitchen where three men sit beside a bright blue wooden table. A fire burns in an earthen stove, and 8-inch lengths of hard cheese hang from the rafters. Beyond the kitchen is another room, visible through two tiny glass windows. The kitchen is dark but the other room is bright with sunshine beaming through a skylight of plastic sheeting. The ailing woman sits inside that room. We watch intently. We have no idea what to expect. We have never seen an exorcism before. And thus, the ritual begins. The exorcist, a 30-year-old man named Tirtha Bahadur, sits in the center of the kitchen. He places a dried flower into a tiny bamboo basket shaped like a cone. He sticks the bamboo into the wooden floor beside an array of itemsâ€”a small fire burner, a tray of raw rice with a piece of ginger, a vase of green leaves and a plate of incense shavings. The woman enters the kitchen and sits beside Tirtha. He sprinkles vermilion over the flower, then lifts a few pieces of dried incense and hums a scripture. Three times he sprinkles incense onto the glowing embers of his hot little burner. After each sprinkling, he clasps his hands in prayer. Then he grabs a few grains of rice and sprinkles those onto the flower. The room fills with the perfume of incense. Tirtha raises the green leaves over the flower, then lifts rice in his right hand and ginger in his left. The rice grains spill onto the flower. He lifts the greens again and sprinkles water from their stems onto the flower. Then more rice onto the flower. Then rice raised to the womanâ€™s head. Two more handfuls of incense are tossed into the embers. Flowery, spicy smoke sails upward; the room smells of cedar now. Throughout all of this, Tirtha chants. He swings his right arm around the woman, circling her with a handful of rice. This continues about 10 minutes as Tirtha whispers soft prayers between quickly moving lips. Then he raises his hand to the woman, gives her a few grains of rice and holds the bamboo cone for her to spit into. 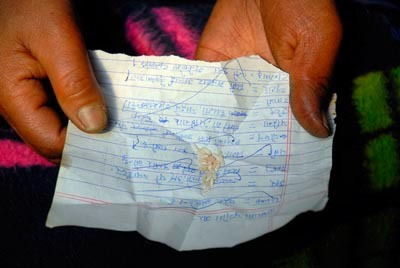 She fingers the rice, eats a few grains and places the rest in a scrap of paper. Then she returns to her little sunlit room. I talk to Tirtha for a few moments. His name means â€œto go on a religious tour,â€ he tells me. â€œI have been doing this 18 years. I was born this way. My parents knewâ€”when I touched someone, he was cured.â€ He travels far and wide to perform these rituals; he requires food and a little money as payment. Then I enter the small room and talk to the woman, named Daki. She is unable to move her arm, which looks out of place and oddly bent at the elbow. â€œI didnâ€™t fall down or anything,â€ she says. It just stopped working one day. â€œThe medicine man came six months ago. My arm got better. It comes and goes.â€ She says she must eat seven grains of raw rice for the next three nights before she goes to sleep. She is certain she will get better. Fascinating stuff, do you know what the significance of the rice is? What do you think to spiritual healing in general? Anyway, that’s enough questions for now! We received only the most basic of explanations. Rice, of course, is the lifeblood of the culture. I think it’s only natural that people regard it with such high esteem, not just here but in so many regions where this grain has sustained humanity for so long. Ginger (like the incense) has long been regarded for its healing properties beyond its basic culinary uses. The intersection of food and health in Asia is absolutely fascinating to me, and I will be writing more about this very soon. Likewise, I’m fascinated by spiritual healing in Asia. It is everywhere, but particularly in the most rural areasâ€”understandably so. The people who live along this trail we trekked are a day or two or three (by foot) away from the nearest city doctor. As they told us, people don’t have the time or the money to travel such distances. For centuries, villagers have had to cure themselves. Thus, we have the basis for ancient cuisines (such as Ayurvedic foods) that heal and nourish at the same time. More and more, the Western world is learning hard scientific facts to support much of what Asians have said for eons. Tea clears the mind and turmeric helps aching joints and bonesâ€”ancient ideas, but now we know them to be scientifically true. To me, it makes perfect sense that the very ingredients people have long used for eating and healing appear in spiritual rituals aimed at better health. And it makes perfect sense that people would call in an exorcist rather than trek 12 hours over 10,000-foot mountains to find a city doctor. Do I believe eating a handful of raw rice each night before I go to bed will cure my aching arm? Probably not as such. But I do believe rice has the power to heal the hungry, ginger is one of the most health-inducing foods on earth (I eat chunks of it raw when I have a scratchy throat or upset stomach; it works), and herbal incense can calm the mind. I can easily see how these rituals developed and why. Beyond all that, I think our minds have far more power than we in the West often allow. I do believe in a direct and intense connection between body and mind. If Daki believes her little packet of blessed rice will cure her armâ€”it just might. It’s all infinitely fascinating to me! 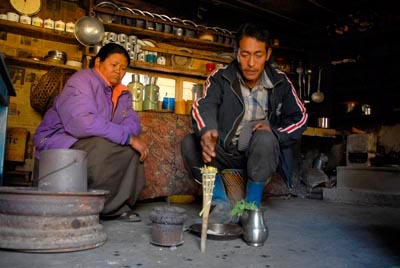 In Nepal generally (not just in the area that Karen wrote so beautifully about) curing exorcisms (hlabeu) are like tea parties – literally – the shaman invites the gods in for food and drink and offers them his hospitality. Once present, the shaman discusses the patient and his/her symptoms with the gods and together they come up with a treatment. The throwing of the rice is to get the attention of the gods and the cone (torma) is used to draw the illness out of the patient (hence the spitting). The ritual is much the same in Tibet as well. Check out Sherry Ortner for more than you probably want to know on the symbolism of food in Himalayan ritual. That’s very interesting,I absolutely agree about the health qualities of ginger and other Asian staples such as garlic, fenugreek etc so that does make sense. I think preconceived ideas often prevent those of us in the West from accepting other forms of medicine. We’re a cynical bunch! Laura, thanks for the insights and the reference. You can find many parallels as well among Southeast Asian ceremonies performed for peace, health and safe travel. Miles, I just noticed I used the word “fascinating” or some variation thereof at least three times in my reply to your questions. I guess you can safely say I’m interested in the topic! Don’t be hard on yourself, you’ve read my blog, if that’s not in need of an editor I don’t know what is!! I sincerely hope the sick woman had access to some actual medical care. Symbolism does not cure disease or broken bones. Does that region have “barefoot doctors”? We didn’t hear of any “barefoot doctors” in the area, but that doesn’t necessarily mean they don’t exist. It also didn’t sound as though Daki, or anyone else nearby, had seen as you say “actual medical care” in recent times. From what the locals said, they regularly rely on medicine men such as Tirtha. Wow, that is so incredibly fascinating! That’s amazing that they let you watch and take your beautiful pictures and I’m so glad you shared it with the world! I hope she gets well soon – I’m one to believe in the power of medicine such as that, especially in areas of the world where they have relied on it for so many years. I love the new look of the site!! It’s interesting, people are generally very open to having us hang out and watch what they do. They’re happy to have people interested and ask questions. Only rarely do people shoo us away, and then of course we don’t intrude.